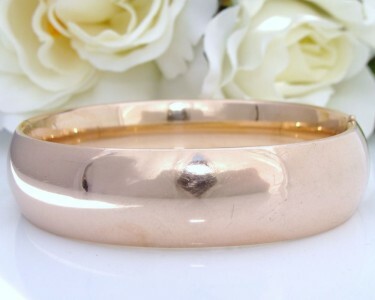 This Heirloom Quality Antique bangle bracelet simply exudes that Classic & Elegant styling so Highly Sought After yet rarely found. It has WOW factor due to its High Quality, Thickness and being perfectly plain. It is a superb example of the quality its maker is so renowned for with lovely elongated shaping and beautifully domed sides. It has the silky smooth feel usually only associated with solid carat gold and expected of quality antique/vintage jewellery. It has a soft pink/rose gold hue. Maker: C. A. Marsh & Company. They are known to have been operating in 1904, if not earlier and produced a range of items including gold filled chains, bracelets, buttons, lockets and lorgnettes. The quality of their pieces makes them highly sought after by collectors - I would place them on par for quality with Bates & Bacon, a favourite maker of mine and one I consider to be the BEST. Circumference: about 19cm or 7.5"
Better-than-Excellent Antique condition! There is a light scuff which the camera exaggerates - it is barely visible to the naked eye. There are no dents, wear, damage or repairs and the hinge and push button tab are in perfect working order. 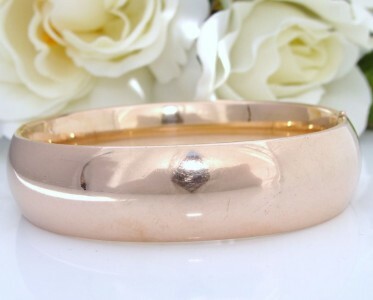 These QUALITY Antique bangles with a ROSE GOLD HUE are HIGHLY SOUGHT after yet RARELY FOUND. Don't miss this beauty as this is the only one I have available.